Born and raised in Maryland, It came natural to Jeff to have incredible passion and curiosity for the sea. This instinct led Captain Jeff to become a motivated explorer of the oceans. Jeff has logged over 6000 days on the high seas in search of giant gamefish. At the ripe old age of 19 Jeff moved to Maui with his surfboard and tackle box, and he was hell-bent on using them year round as much as possible! In no time at all Jeff found himself in the cockpit of a game boat! Jeff worked his way up to the Captains seat and has been there for 25 years plus! Its been his goal to assist each client in catching their biggest fish to date. Jeff caught Maui’s first Grander! The 1118 pound blue marlin was caught in 2002 and to this day still stands as Maui's record. Capt. Jeff has been in search of Granders from black marlin on Australia’s Great Barrier Reef to giant bluefin tuna off the coast of Nova Scotia! Capt Jeff is a proven winner who fishes in as many tournaments as possible! 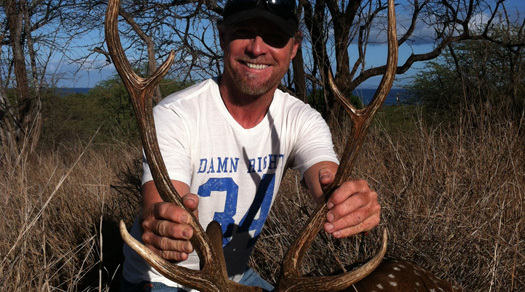 In fact, he founded and hosts The Halloween Shootout which is one of Hawaii’s biggest marlin tournaments. With four children who share a passion for the ocean as much as Jeff, don’t be surprised to see one of them setting a pattern for you on board the Piper. Climb aboard Captain Jeff’s owned and operated 47 foot Cabo and head out on an unforgettable fishing journey!